On a day of hazy sunshine and a deceptively strong end-to-end breeze, the 'Ensians produced some brilliant fast expansive rugby in their return match with Ossett. The scoreline of 43 points to 5 in the home side's favour perhaps did not do justice to Ossett's periods of pressure, which called for resolute defensive work from 'Ensians. In the scrum too, the visitors dominated, pushing their opponents back with alarming regularity. Overall, 'Ensians could have gone on to a bigger total, but Ossett could equally have recorded more than their solitary try. The game was, however, enjoyable for players and crowd (a large one) alike. Ossett had the wind in the first half and clearly their game plan was to push the opposition back and try to play in the right half of the field, but kicking needs to be accurate and it was not long before they were defending. After some 5 minutes Ossett were penalised and full back Ben Hatton kicked the Old Boys into an opening lead. Shortly afterwards, centre Luke Cowdell made ground and found a well-timed pass to put winger Declan Jackson over for a good try. Ben Hatton's conversion attempt drifted to the left from wide out. Scrum half Rob Lofthouse again showed his all-round qualities with successive determined tackles which put the visitors under pressure. After just a quarter of an hour's play, turnovers, kicking exchanges, interceptions and all, good running by Luke Cowdell kept his side in opposition territory. The pressure told when good ball and a long miss-pass put Cowdell into space for an easy run to the posts. Ben Hatton added the extras. Confidence was high, but a careless pass on the left wing was intercepted by an Ossett three quarter for a long but uncontested run to the corner. The conversion failed and the score of 15:5 was about right. The ball was dropped from the restart and Ossett again exerted good pressure. However, 'Ensians' backs looked dangerous with ball in hand and there were exciting, strong runs from the Hatton brothers, Ben and Joe, and centres Nathan Rogers and Luke Cowdell. Ossett began to fall foul of the referee for scrum feeding and on the half hour mark Ben Hatton was successful with his penalty attempt. Just prior to the break, scrum half Rob Lofthouse was injured and some re-organisation saw Ben Hatton take over at scrum half with Kristian Keinhorst coming on at full back. With half time imminent, Luke Cowdell breached the defence to put Declan Jackson in for his second try. 23:5 did not truly reflect the end-to-end rugby, but turning pressure into points is what counts and 'Ensians had done just that. The second half opened with Ossett immediately penalised and Ben Hatton kicked to the corner. The lineout was lost however, Ossett pressed, Otliensians countered and Ossett were penalised again. Ben Hatton duly punished with his three-point kick. Rob Lofthouse returned to the fray and there was an outstanding break and run from 'Ensians' prop Ross Nichols. Attractive, pacy, strong running and handling followed as winger Joe Hatton, Jackson and centres Cowdell and Rogers enjoyed the conditions and Jackson went over for his hat-trick try. Rob Lofthouse's appetite for the tackle was again prominent, Ben Hatton went off and Keinhorst came on for his second stint. At 31:5 some focus was lost and the game became rather scrappy; Rogers had to leave the field with an injury and Ben Hatton returned. Ossett were penalised and then sent back ten metres for backchat. Ben Hatton tapped and ran superbly and a long pass gave Jackson a run to the corner for his fourth. The kick was narrowly off target. 'Ensians were clearly on top, but Ossett were still dominating the scrum set piece and were frustrated that their threes had not been able to capitalise on their hard-won possession. However, a great drive from the home team pushed Rob Lofthouse close, but resulted in his leaving the field again with leg problems. Flanker Lee O'Donnell also retired, with Rob Arbuckle replacing him at No. 8 and Ben Hatton slotting in at scrum half again. 'Ensians suffered a spate of forward passes, Ossett were warned once more and there was perhaps too much ball kicked away, but enjoyment was the order of the day, which ended beautifully with Declan Jackson's fifth try celebrated with an Ashton-like swallow dive! Ben's great strike added the two points and the final score was certainly very satisfying for the Chaffer's Field team. Two 'Ensians sides at home, car park full, clubhouse noisy, lively and good-spirited. Rugby had been well served. 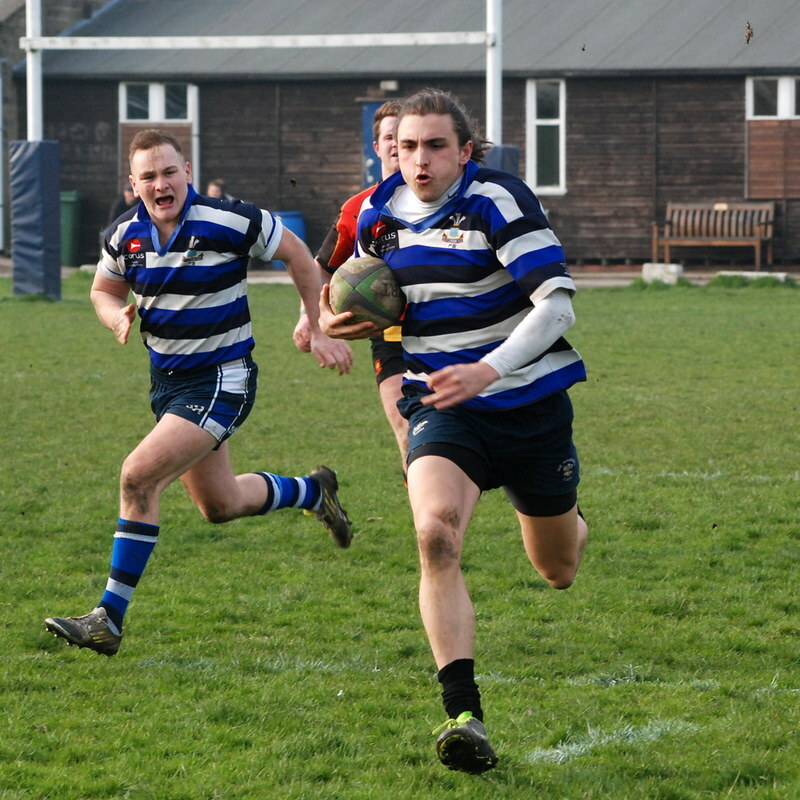 Next Saturday 'Ensians face a stiff test away at Halifax in the penultimate League match. 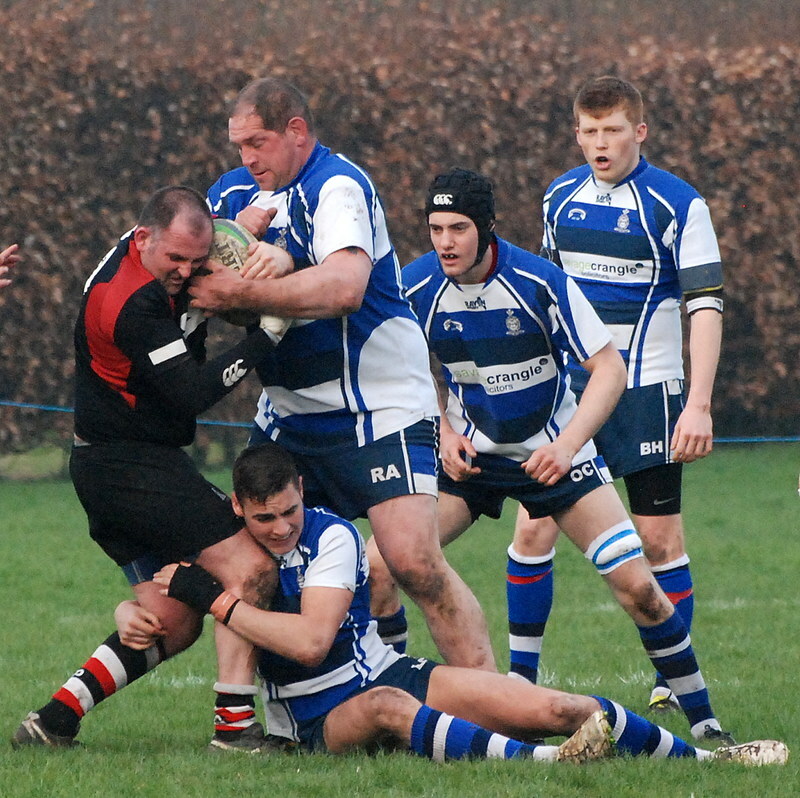 'Ensians 2nd XV had a fine 43 - 27 win in an entertaining game at home to Harrogate Pirates. Scorers were: tries Josh Howarth (2), Toby Leiber, Connor Paley (2), Andreas Xiarchos and Connor Bateman, with four conversions by Bateman.